I was having a talk with a friend in San Francisco last Monday about globalisation and the capacity of the state, which is the topic of the upcoming book I am working on (manuscript due around May 2015). He made the comment that globalisation had meant that the state can now only do bad and can no longer do good. I asked him whether he was talking about globalisation (the international nature of finance and supply chains) or neo-liberalism (free market economics) and he said “neo-liberalism is a disease – that is the problem and since the 1970s it has meant the state is restricted to doing bad”. The point I was digging at was that progressives often conflates the two concepts which then leads to flawed conclusions about what the state can and cannot do. Further, when he talked about the state doing bad he was really talking about the impact on the average person and those who are disadvantaged. He wasn’t talking about the so-called top-end-of-town, which have without any question done very well since the 1970s. And that is my next point – the state hasn’t gone way or been rendered impotent by neo-liberalism as many on the Left believe and angst over. As the currency issuer it is still very powerful. It just serves the interests of a different cohort now relative to the cohort it served during the full employment period that followed the Second World War. In doing so, it has shifted from being a mediator of class conflict to serving the interests of capital in its battle to appropriate ever increasing shares of real income from labour. That is a wholly different narrative to the one that emerges when globalisation is conflated with neo-liberalism – as if they are parts of the same process. Some of the themes in this blog were introduced into the second-listed blog series above. The blogs in these series should be considered working notes rather than self-contained topics. Ultimately, they will be edited into the final manuscript of the book. The research I have been doing in the last few days continues the theme that globalisation has not rendered the nation state impotent. The thesis, as outlined in the introduction, is that the nation state has just changed its role and now uses its power to advance more narrow interests than previously. In the Northern Spring of 1995, the official journal of the American Academy of Arts and Sciences, Daedalus, published a special edition on the theme of – What Future for the State? (Vol. 124, No. 2, Spring, 1995). One article in this special edition – The New World Order, Incorporated:The Rise of Business and the Decline of the Nation-State – (pages 75-106) – which has proven influential since, was written by American international relations academic Vivien Schmidt, who ironically, given the tenor of her argument, has a position at an American university which is part of the European Jean Monnet program funded by several European ‘nation’ states. The link to the article is to the JSTOR archive and you can download it from there only if your library allows you access. Schmidt (p.75) says that “Capital has become increasingly mobile on business increasingly international as borders that act as barriers to trade for and as regulations are constrained, is a lifted”. She mentions a range of multilateral agreements such as the General Agreement on Tariffs and Trade (GATT) as facilitating this increased liberalisation of business. It has also resulted from the political and economic reforms internal to nation-states, such as privatization, deregulation, and decentralization, which of diminished central governments’ powers at the same time that they have freed business even more. First, we see here the classic conflation of two separable evolutions. On one hand, she describes a world where capital (which should be taken to mean financial capital not productive machinery and equipment) is now more mobile and there has been an increased integration of world trade. On the other hand, she mixes these trends with specific policy positions taken by governments over the last 30 to 40 years as if they have facilitated the increased global nature of international capital flows. There is also a crucial difference between globalisation (by which I mean the growth of transnational corporations and international supply chains) and the neo-liberal ideology (by which I mean the dominance of free market economics, the demonisation of government intervention, the demands to eliminate the welfare state and the widespread deregulation of financial and labour markets). Those two developments are separable and distinct although the latter certainly reinforces the threats imposed on nation states by the former. My view is that the ‘Left’ has conflated the two developments and falsely concludes that globalisation is tantamount to the demise of the nation-state. It isn’t. What has led to the change in the way the nation-state behaves is the imposition of the neo-liberal ideology. That historical shift was a matter of choice. It is a fashion or flavour that can change with human will. Democracies can choose whether to allow the nation-state, by which I mean the currency-issuing government, to use its capacities in many different ways and to serve any number of competing interests. In the full employment era, it was obvious that the state acted as a mediator in the conflict over the distribution of national income between labour and capital. The assumption was that without regulative oversight, safety nets (welfare states), and direct public employment, capitalism would be too unstable to deliver sustained improvements in material living standards. However, that role began to change in the mid-1970s, as the ‘free market’ ideology started to seep out of the academic halls into broader society. This was an explicit, and, as we now understand, well-funded campaign in the service of capital. What we now term neo-liberalism is not a new invention. Prior to the Great Depression, it was the dominant economic paradigm. Its rejection at that time reflected its catastrophic failure to deal with the Depression and the emergence of a new way of thinking about the role of the state and the macroeconomy. In the Anglo world, that new way of thinking was marked by the publication of John Maynard Keynes’s ‘The General Theory’, which categorically showed the logical errors in the ‘liberal’ approach in relation to how the real monetary system operated. Classical liberalism was dumped as a viable policy-setting framework because it failed. We learned during that time that capitalism could easily go awry and the consequences were highly destructive. When I talk of neo-liberalism, I am referring to a specific body of economic theory and a set of policy prescriptions that flow from that economic theory. Neoliberal theory claims that a largely unregulated capitalist system (a “free market economy”) not only embodies the ideal of free individual choice but also achieves optimum economic performance with respect to efficiency, economic growth, technical progress, and distributional justice. The state is assigned a very limited economic role: defining property rights, enforcing contracts, and regulating the money supply.1 State intervention to correct market failures is viewed with suspicion, on the ground that such intervention is likely to create more problems than it solves. The policy recommendations of neoliberalism are concerned mainly with dismantling what remains of the regulationist welfare state. These recommendations include deregulation of business; privatization of public activities and assets; elimination of, or cutbacks in, social welfare programs; and reduction of taxes on businesses and the investing class. In the international sphere, neoliberalism calls for free movement of goods, services, capital, and money (but not people) across national boundaries. [Reference: Kotz, D.M. (2002) ‘Globalization and Neoliberalism’, Rethinking Marxism, 12(2), 64-79]. You can see a close correspondence between the neo-liberal policy recommendations outlined by David Kotz and the facilitating factors proposed by Vivian Schmidt. But these policy recommendations are choices made by the political system they are not inevitable nor can any corporation force a polity to adopt these policies. These policies have become dominant because capital has conducted an extremely well orchestrated and well-funded campaign, using its concentration of power in the media, its lobbying capacities to exploit the greed of corruptible politicians, and its ability to ‘buy’ academic support. The general population lives in smoke haze of half-truths, misperceptions and outright lies, all driven by some fear of loss that is whipped up daily in the media as part of the above campaign. Citizens continually support policies that make them worse off even when the politicians, in the ‘pay’ of the interests of capital, tell them they will be better off. These cumulative episodes of promise and failure have increasingly led to the refinement of the TINA (There Is No Alternative) strategy. In other words, the people have to sacrifice in order that the economy becomes ‘well’ again. What made it ‘sick’ is another question. When Margaret Thatcher’s first tranche of policy attacks on the state welfare system and workers in general had rather obvious negative outcomes, the claim was that they hadn’t implemented Monetarism enough. As each state company was sold off all regulation relaxed, the same argument kept being made – there is more to do. In other words for the last 3 to 4 decades, the neo-liberals have been ‘cleaning up the mess’ that they inherited. The story should wear thin but it doesn’t, such is the skill of the propaganda campaign. Thus, signing up to these so-called ‘free trade agreements’ and creating tax havens for TNCs and deregulating labour markets to allow the TNCs to increase their profit rates at the expense of the local population reflected a policy choice made by the state to favour capital. There was nothing inevitable about that at all and it was not dictated by the increased global nature of production and supply. If the Communitarian sentiment that prevailed after the Second World War had not have been corrupted by the monied interests of capital, states could have rejected the demands by corporations, for example, to have so-called ‘investor-state dispute settlement’ mechanisms included in these agreements and governments could have insisted on the priority of the national laws. As an aside, one should not glow to much about the full employment era. There was a strong sense of collective will, which created a strong sense of ‘society’ – something that Margaret Thatcher tried to deny during an interview with the Women’s Own Magazine on October 31, 1987. But there were also gender and race inequalities, a disregard for the natural environment, and the lull in overt capital-labour conflict was partly achieved by the state guarantee of employment as a consequence of its full employment policies, but also, through the rise of mass consumption. Marx, in the – Introduction, A Contribution to the Critique of Hegel’s Philosophy of Right – published in the Deutsch-Französische Jahrbücher (February 1844) was proposing that humans have the capacity for self-deceit and create religions for that purpose. The important point he was making is that there is human agency involved. Mass consumption became the opiate in the Post Second World War period. 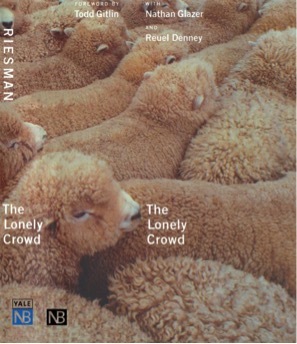 In 1950, American sociologist David Riesman published his book – The Lonely Crowd: A Study of the Changing American Character – which describes middle class life in the US where people understood their ‘self’ with reference to the way they observed everyone else living. It is the largest selling book on sociology of all time ((Source). [Reference: Riesman, D. (1950) The Lonely Crowd: A Study of the Changing American Character, New Haven, Yale University Press]. Previously, people had what Riesman called an ‘inner-directed’ motivation, which meant that they acted according to their own sense of behavioural rules. Mass consumption was an essential aspect of this shift and defined visible patterns for others to mimic – the type and size of car in the driveway, the style of house, the clothing worn etc. This patterned behaviour based on mass consumption was coercive but it diverted attention away from the essential conflicts between labour and capital, which had been more apparent to everyone during the production era before the consumption possibilities expanded for all. The conformity also allowed capitalists to saturate ‘markets’ with mass produced and ever cheaper products that delivered high margins. [Reference: Riesman, D. (1964) Abundance for What? and Other Essays, New York, Doubleday and Co]. In one of the Essays, The Suburban Dislocation, which had been previously published in the Annals of the American Academy of Political and Social Science in 1957, Riesman discusses the way in which industrial mentality from production infiltrate domestic life. Indeed, one reason why husbands have been willing to become domesticated is that they have been promoted from dishwashers to operators of dishwashers. Similarly, they use power mowers to give crew cuts to handkerchief-sized lawns and pierce their wives’ and neighbors’ ears with the screams of high-fidelity music. The open plan of the very newest ranch-style homes puts the TV set on a swivel in the center. Here it can be seen from all parts of the house so that urban news, fashions, gossip, and jokes can circulate in the homethroughout the daily cycle of the members of the family. But all these improvements are bought at the expense of space for the individual whose bedroom in the suburban development is often smaller than in city tenements. [Reference: Riesman, D. (1957) ‘The Suburban Dislocation’, Annals of the American Academy of Political and Social Science, Vol. 314, Metropolis in Ferment, 123-146 – JSTOR link]. The era of mass consumption after the Second World War diverted attention of workers from the production process to the shopping centre, which took over where religion left off. There was an abundance of mass produced goods like never before and the new consumption boom also meant that the distribution of national income had to shift so that workers could purchase the ever-growing flow of goods (and then services) into the shops. In this sense, real wages grew with productivity and the problem of capitalist realisation was averted. A period of relative calm emerged and the shopping centres crammed with all manner of goods functioned as the sedative. This was the period before the financial deregulation began and capital had yet to discover that it could have it both ways: it could suppress real wages growth and still realise the surplus value on the ever-increasing volume of output it was producing by simply loading households up with debt. The financial engineers would come along a little later to facilitate that new era of financial capital. But during the full employment era, capitalism was forced to share the spoils more evenly and mass consumption and real wages growth was the manifestation of that accommodation. So how was it that the population were increasingly able to support the shifts that occurred in the early 1970s when Monetarism reared its ugly head and signalled a return to the economic dogma that had dominated before Keynes? Thus, after a million years of labour, during which humans created not only a complex social culture but in a very real sense created themselves as well, the very cultural-biological trait upon which this entire evolution is founded has been brought, within the last two hundred years, to a crisis, a crisis which Marcuse aptly calls the threat of a “catastrophe of the human essence”. The unity of thought and action, conception and execution, hand and mind which capitalism threatened from its beginnings, is now attacked by a systematic dissolution employing all the resources of science and the various engineering disciplines based upon it. The subjective factor of the labour process is removed to a place among its inanimate objective factors. To the materials and instruments of production are added a “labour force”, another “factor of production”, and the process is henceforth carried on by management as the sole subjective element (pages 170-71). Progressively, these “labour processes” (market-values) subsume our whole lives – sport, leisure, learning, family – the lot. Everything becomes a capitalist surplus-creating process. The mass consumption era morphed into something even more comprehensive where aspects of our lives that were previously consider ‘non work’ (which meant non capitalist) became markets, with commodities supplied to support. The technological gadget revolution has accelerated this process. Harry Braverman clearly understood that the capitalist profit-seeking machine would seek to impose its constructs on all aspects of human activity. Even those activities that were previously part of our non-working lives – our lives away from the oppression of work. The aim was to make everything ‘work’ by which a special meaning was attached – that activity that allowed private capital to make profits and accumulate more capital. The neo-liberal narrative thus had more to work with. Only activities that were part of this spread of labour processes was deemed productive. Public employment, especially large-scale job creation programs to reduce unemployment in times of recession, was vilified as being unproductive and constituted boondoggling. While capitalist interests have always exploited gender, age and race differences as a tactic to divide-and-conquer the labour force – to amplify differences between working class groups and subvert any threat that subjective class consciousness might become pervasive, the chaos surrounding the OPEC oil crises and the resulting rise in mass unemployment gave them new terrain. The unemployed were constructed as indolent dolts (unskilled) who were not prepared to put their ‘shoulder against the wheel’ like the rest of us employed workers. They were also reluctant to work because states subsidised their sloth through income support schemes. These ideas came straight out of the mainstream economics textbooks, which preached the market-based dogma that was as far removed from reality as one could imagine. Mass unemployment was no longer considered to be a systemic failure of the system to create enough jobs due to spending failure. It had become an individual phenomenon where the unemployed were the culprits and the state should do everything it could to avoid providing incentives to these ‘bludgers’ to continue their wayward and parasitic behaviour. A nomenclature emerged to support this – dole bludgers, cruisers, lifters and leaners – and Ayn Rand must have smiled in her grave as her vision of the workers draining the wealth created by the entrepreneurs was elevated to the central stage of the public narrative. The pre-Great Depression belief that unemployment was also generated by excessive real wages was also brought back into the narrative as if it was an eternal law or truth. Governments were also implicated through their interference into the market via minimum wage dictates. The case against the state was by now being comprehensive orchestrated by a number of well-funded think tanks and key industrial peak bodies and their messages were amplified at megaphone volume by the conservative media. We hardly noticed that our real wages growth had stalled because at the same time our credit cards appeared with generous limits and banks opened up their loan desks (we didn’t know they were securitising our mortgages). The credit boom driven by aggressive financial engineering allowed economic growth to continue. It was like the game ‘pass the parcel’ – it was always going to blow up but for any particular individual there was time to enjoy the game and pile up the debts on the credit card. This was mass consumption with all the vacuousness that Riesman had identified in 1950 still present but, now, with a ticking time bomb, which was hidden from our view and understanding. I will continue this discussion on Monday when I take into account Vivien Schmidt’s arguments about the demise of the state in more detail. In Southern California at the moment (Santa Monica) and today (Thursday, January 7, 2015) record rainfall is expected. Already multiples of the normal January rainfall has fallen in this general area and only six days of the month have elapsed. Back home, the Hunter Valley near Newcastle is experiencing record rains, flooding and high winds. There is generalised chaos on the roads as people try to find ways through the floods. The Hunter River which flows into Newcastle Harbour and out into the Pacific Ocean, has broken its banks upstream and residents are in trouble. It seems weird that on both sides of the Pacific, where I live and where I currently am working, are experiencing similar extreme weather events. And, on the other side of the Australian continent there is now a bushfire emergency with “lives and homes in the area under threat” (Source). But none of this has got nothing to do climate change has it! For the runners out there who travel and are always on the lookout for running circuits, I have done two runs now around this part of the coast. First, late yesterday, I ran south from the Santa Monica Pier (about) to the Marina del Rey via Venice Beach – 11 kms return trip. There is a well-defined running path (Ocean Front Walk) all the way down the coast which is largely flat. I did this run as it became dark and it was very stormy – the run back up North was into a very stiff headwind. Today, I ran north from the near the Pier where I am staying along the Ocean Front Walk to Sunset Beach, which is where Sunset Boulevard at Inceville hit the CA-1 (Pacific Coast Highway). The round trip 13.3 kms. 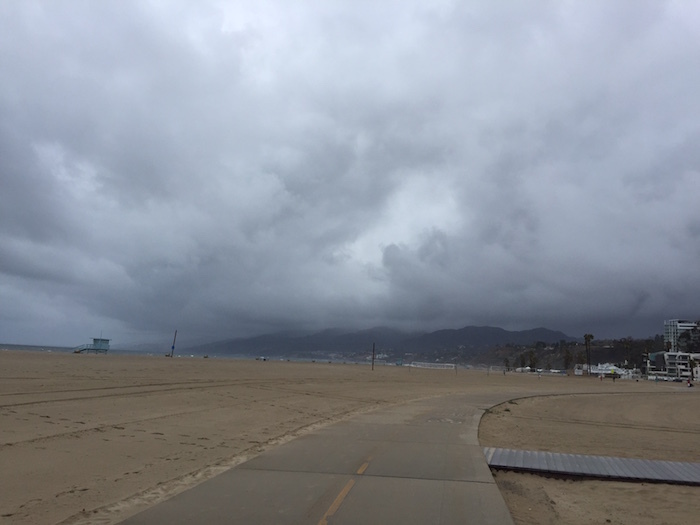 Here is a photo of the storm looking north to Malibu. It was drizzle heading north into the wind but then the heavens opened and it poured. Luckily, heading back after the turn around the wind was favourable. I would recommend both runs. Tomorrow, before I leave I plan a run up to the Will Rogers State Historic Park, which is in the mountains overlooking the coast just north of Santa Monica beach – weather permitting. From January 2016, the Saturday Quiz will be available on Friday to replace the Friday Lay Day blog. The Answers and Discussion will appear each Saturday morning (East Coast Australian Time). We will all have Sunday free. This will also give me a bit more time during the week to write other things and fit a lot of upcoming commitments and deadlines in more easily. I haven’t decided what I will do about the Friday music segment. Yes capitalism and religion have psychologies that encourage infantilism, puritanism, authoritarianism, consumerism, and increasingly shallowness and distraction. I couldn’t agree more. That’s why I’m for Distributism and Wisdom, and Wisdom’s pinnacle concept and natural value Grace/graciousness which requires a rational and ethical mental rigor plus contemplation in order to avoid falling into the above flawed “hang ups” which inhibit mental as well as economic and monetary flow. There’s a duality to the trinity-unity of the dialectic that goes: thesis, antithesis and synthesis….and thesis, antithesis and ascension of knowledge/knowingness. A trenchant analysis, Bill, that only needs a discussion of William Whyte’s The Organization Man to round it off. Whyte analyzed the price paid by organization men (and they were mostly men at the time he wrote the book) for being part of the corporate system, stultifying conformity. In an appendix, Whyte discusses how to cheat on personality tests, which were then all the rage and for years after. The current weather in certain parts of the world is not overly unusual when looked at in the longer term. It is unwise to confuse weather with climate as this just plays into the hands of the climate change deniers. There are several scientifically verifiable reasons why we are in the midst of global warming which is accelerating. Atmospheric CO 2 levels have been on the rise for about 50 years. This inevitably causes more of the suns energy to be retained as heat in the atmosphere but mainly in the oceans which are a heat sink. Consequently we have a steady increase in sea levels.The oceans are also a CO 2 sink hence rising acidification of seawater. This is a disaster for a lot of vital marine life. The increased ocean temperature is causing more sea ice loss in the Arctic Ocean which is the canary in the coal mine. Rising Arctic temperatures are melting permafrost and probably allowing more methane (a powerful greenhouse gas) to escape. Conversely there is increased sea ice in the Antarctic but a warmer Southern Ocean is causing ice shelf collapse from beneath.This is fresh water ice and so adds to sea level. Glaciers worldwide are in almost universal retreat. The Greenland ice sheet is diminishing. So,there are plenty of verifiable reasons why we are toast without blaming the fickle weather. Welcome to the World of the Brave New Climate. Thanks Bill for a very culturally rich analysis with interestingly referenced. This is helping me understand my own past-at 55 the election of Thatcher was the first election I took part in and now, nearly 40 years later it’s trying to dig its claws in deeper with a ‘zombie’ Thatcher living beyond the grave. The conflation of globalisation as a causal factor in neo-liberalism’s rise is worth being aware of but it is hard to see them as distinct entities or separate streams. Could there have been a benign form of globalisation in a world of non-pegged currency issuing Governments? The nature of Globalisation is to find the cheaper Labour as the neo-lib myth repeats the mantra that the suffering will pay of as the rising tide lifts the boats? A lot of people regard globalization, whatever they mean by it, as a force of nature which humans are powerless to change. That is ridiculous. One particular silly argument is that transportation and communications costs are now so low that it has become very easy to ship goods and to travel between countries. Well, I live in an apartment building. The other residents can go from their place to mine in less than 5 minutes. Should we all have the right to enter each other’s apartments at will because it is so easy to move within the building? Of course not. Similarly, the fact that transportation costs between the US and Mexico are now very low doesn’t imply that Mexicans and Mexican goods should be entirely free to enter the US. That should happen only when it is in the interest of all Americans. Part of globalization consists of the transfer of the least skilled parts of manufacturing to low-wage countries. Even if we can’t stop those transfers, we can still impose tariffs on goods from low-wage countries. According to the only Frenchman who won the Nobel Prize of Economics (forgot his name), trade between high-wage and low-wage countries is not a win-win situation. He claims that it is detrimental to the economic well-being of most people within high-wage countries. I couldn’t follow his arguments because he uses a lot of math. However, he may well be right. If he is, then some restrictions on the import of goods from low-wage countries into high-wage countries may be called-for. It certainly is possible. Borders still exist, and only very inefficient states don’t know how to control the flow of people and goods across their borders. If the US really wanted to, it could reduce the inflow of illegals from Mexico and other Latin American countries to virtually nothing. It certainly would be cheaper than fighting futile wars in the Middle East and elsewhere. Even cross-border trade in services can be curtailed. If a Canadian company outsources some of its operations to India through the internet, then it could be forced to pay a tariff on those services. The internet doesn’t guarantee a totally free cross-border flow of information either. Just ask the Chinese. When people invoke TINA, they are usually wrong. There are alternatives to globalization, which doesn’t meant that they are good ones. Globalization is part of neoliberalism agenda, for obvious reasons, helps business interests and hurts/limits labor bargaining power. The left plays into the neoliberal speak book because they ideological bias: a profound hate of nationalism and internationalists kumba-ya dreams. By doing this they reinforce a sort of TINA narrative (because they are all “my way or the highway”, in this case: “internationalism uber alles or chaos”) in which they hope capitalists international institutions can be co-opted and reformed and a New World Order where the smart progressive technocrats can rule for the people without the people. Neoliberalism and progressivism have many thing in common, and align in many places. Both are elitists projects born from the Enlightenment, where people is not trusted and has to be managed. Their goals may be different, but the path towards the goals align many times. By listening to the “internationalist right” (neoliberalism/big biz and finance interests) playbook, the internationalist left is unleashing forces they do not understand and control. We are replaying again the early last century book, when the left basically handed, with the compromise of the conservatives (which are intrinsically cowards, as cowardice is what allows the status quo to continue, which is what to ‘conserve’ exactly means) power to fascist forces all over Europe and Japan. We are in a critical moment, this year or the next could very well our real 1929, 2008 was just a prelude, because a lot of political capital was burnt back then to keep the can kicking with massive nation state interventions to serve their oligarch masters. All the bubbles that have keep the system running are now being exhausted as the credit cycle turns down: household appetite for debt or credit worthiness is low, business took over the debt growth the last 5 years, but can take no more, and the junk debt market is rattling and many sectors are being crushed with increasing chapter 11 fillings after the CEO’s made all the money through financial engineering the last years (energy, commodities, housing, and some markets like real estate bubbles in places like California or London have yet to come down hard). The world is awash of overcapacity and lacking earning income and poor distribution, USA is now an empire in full collision mode and about to press the accelerator. There are many moving parts on a crash course which will force us to re-examine the system, is hard to tell if we are past the point of the keynesian tradition of ‘saving capitalism from itself’ will be unable to do anything, amongst this tradition I place MMT. The second part is that the critique of a throw-away mass-consumption culture from an ‘industrialist’ theory like MMT is hard to digest. I mean, I’m aware and sure that most MMT academics would like a JG to eb awesomely designed and implemented in a worldwide scale so not to be subservient to the same capitalist interests which . But the reality is that we are not at that point, and are far away from it, this risks may b worth taking, but I wouldn’t trust the current political apparatchiks on implementing any policy that won’t be corrupted and coopted by the levers of power which control the system for their own host-eating benefits. Without massive political change, we cannot hope for a good resolution of our current problems inclusing both misguided internationalism and consumerism. We are now close to a pre-war and pre-revolutionary stage, when the next crisis unravels (which may be months away), probably >60% of the population will be disenchanted with the status quo (we are almost there as recent , as it throws the majority under the bus. And then we will see what “solutions” present themselves and if the left will screw it up, once again, and handle power to dangerous forces which will set in motion reactionary social forces beyond our control. The owners of large corporations of all kinds have been highly effective in their ongoing campaign to make everyone else believe we are all their dependents. It isn’t true, in fact it’s rather the other way around, but how do you convince the brainwashed masses that money, the economy, markets, industry, sovereign statehood etc, only exist because of their needs and not despite them; that they and not some pampered elite are the ground matter of the existence of all of it, and collectively, their voice that should be the only one that commands it? It’s very clear now that nearly all politicians who take office can do no more than serve only elite interests. Their time should be spent taking steps to strengthen and protect democracy, national sovereignty, and the common good, while they couldn’t be working faster to usher in the new neo fascist or neo feudal world order neo liberalism is drawing us toward. Most of the 99% have had any innate common sense they may have had the good fortune to be born with, educated out of them, partly by the education system itself but mostly through life in this evil grinder of a world we’re tossed into. The working person (those who still exist) gets most ‘knowledge’ of important subjects like economics from watching television or on line versions of MSM in between watching sports or playing video games. I have even read opinion in the “independent” and self proclaimed left leaning media that talks about the progressive/ socialist causes in terms of somehow no longer being relevant to todays economy ” those are your grandfathers issues” etc. Nearly the entire “knowledge” base is thus constructed from snippets of crafted neo liberal sound bites and prose, and the common person defends those memes as though they were in the bible now. This is what politicians on the progressive left have succumbed to if they haven’t been corrupted. MMT doesn’t have a chance against any of this without the state admitting to the truth, educating voters to it and to the true range of choices available to them. Such a duty seems to be entirely missing from state constitutions. Not mentioning the truth is thus permissible. felt in the North East too in the form of an unusually mild winter. We’re just hoping we don’t get another Ice storm like 1998 which left tens of thousands without power for weeks in sub zero temperatures. ” The nature of globalization is to find the cheaper labor as the neo- lib myth repeats the mantra that the suffering will pay off as the rising tide lifts the boats”. Sounds like what everyone was promised about loosely regulated capitalism itself? How does making everybody a poor wage slave help anyone but the oligarchy? It doesn’t, the globalist neo liberal promise is yet another of a series of big lies propagated by self interested elites. Culturally relevant nation states are necessary to the interests of the societies living within their borders. Breaking them down wantonly without informed democratic permission in order to serve a secretive unelected world order which becomes the de facto government is clearly treason; it’s as if the guard purposely let the draw bridge to the castle down, or like Benedict Arnold gradually weakening the defenses through lack of vigilance and due diligence with respect to fortifications. We can float the most boats by trading fairly for materials we don’t have, and sharing knowledge but the labor to produce the goods and services consumed needs to be found within each nations own borders. This will displease those who game inequality globally, the same way they do within nation to their own profit, but it is the way to ensure capitalism can be made the fair, productive and resource efficient scheme it could be. Steve keen’s work suggests that even before the financialisation of western economies.The fundamental antagonism in capitalist economies (according to his models) is not between capitalists and workers,(capitalists share of income is stable,until the very end).But between bankers and workers,as bankers’ income grows at the expense of a shrinking workers’ share of natonal income.interest income grows whiles wages shrink. Either way,It is becoming clear that for capitalism to work and avert crisis, workers’ share of national income has to stay consistently high,and equally distributed across the population.And for this income to not be siphoned off to the FIRE sector but towards real goods and (non-financial) services. Very interesting. I understand that it was 165 years ago this year that, under a new Constitution, the New South Wales Parliament obtained a fully elected Legislative Assembly. So that’s a detail to brighten one’s day, eh! Responsible government was slowly being extended in Britain and Canada, indeed in many parts of the British Empire, in the mid-1800s, and it helps to think of what it took to bring the state under popular control. What it took was a 15 years or more of work, largely through the Chartist movement, to dermand improvement to our electoral systems. The Chartist movement in Britain affected Australia’s politics, for instance in NSW and Victoria, along with Canada’s movement to responsible government in 1848. I sense that that is where we are all headed, back now away from undemocratic ‘investor-state dispute settlement’ mechanisms to the primacy of national laws controlled by representative parliaments and legislatures. Under public and electoral pressure, Clinton and Sanders in the US have come out against the TPPA, Cameron will be forced to take Britain out of the EU, and the Eurozone is collapsing. We are looking atserious electoral and parliamentary reform here in Canada. For the first time in many years, I am feeling rather optimistic. ” mass consumption was coercive ” I don’t understand how this could ever be possible,consumers are voluntary agents in their own consumption beyond the necessities. Secondly if mass production/consumption is a superflous pyscho/religous trance imposed on the masses by the capitalist class does that mean the economy could forgo mass consumption and be rejigged to deliver reasonable living standards for lots of people without mass consumption and in turn without even mass employment. Altough I agree with this,there has been a philosophical shift that sees public investment /services which improve living standards,improve national productivity,reduce the cost of living as somehow less desireable to privatising to private interests and allowing those interests to extract as much profit as possible.This chimes with people’s myths that the private sector “pays” for the government and public sector. Read Walter Lippman and Eduard Bernays-if freedom were as straight forward a matter as you make it, Jake, the world would be a different place. perphaps I will look into those authors.But I am wary of the tone.It reminds me of the middle class snobbery,where the masses dont have the right “mindset” and are too “shallow” and do not not have enough “depth” to pay attention to the real “issues” and that the masses are “uncultivated” and are “morally and intellectually inferior”.I am not one myself for buying the latest gadgets or branded clothes but if people are choosing to buy these things it’s up to them and I say live and let live. I just sat through a show were high court baliffs are evicting income insecure people for failing to pay rent(following job hours cuts)- that’s modern day entertainment for you.Surely the most important issue is making sure that people are prosperous and weathy enough to choose to buy those things in the first place,and not relying on food banks to keep from going hungry or get exhausted and overworked from mind numbing endless hours of underpayed work. its a bit of an excessive Bourgeoisie luxury to complain about others’ material comfort when so many in the west suffer from low pay,overwork,chronic poor health and expensive rents and cost of living. “Capital has become increasingly mobile on business increasingly international as borders that act as barriers to trade for and as regulations are constrained, is a lifted”. Eh? I thought I’d had a stroke for a minute trying to read that. Looking at MMT basics, in what sense is capital mobile? Surely Australian capital (money?) can change hands between individuals of different nations, but it can only be destroyed by taxation (fiat money) or debt repayment (bank money). Does the capital take plane or does it have wings? The use of the term ‘capital flight’ is designed to scare people. That is the sole purpose of it. And since it is possible to dismiss the idea as inapplicable in the floating rate system we should do so. The resources, land and labour remain in the country. All the terminology within the economic sphere is twisted wilfully to scare and frighten. None of it has any concrete definitions. They are all humpty dumpty words. You can’t have classic capital flight in a floating rate system. It is a meaningless concept. All you have is some people selling and other people buying. Those that are buying may or may not be getting a bargain and those that are selling may or may not be losing money – and they might run out of market liquidity before they can sell at all. So what you get is a price change and a redistribution based upon that. And if some entities permanently ‘leave’ a currency area then the currency area shrinks – potentially within the political boundaries of the state issuing the currency (which is what dollarisation is). The problem as I see it is that we have a floating rate system being managed and regulated by control points and notions that were designed for fixed exchange rate structures. The containment system is still stuck in a Bretton Woods mindset and the traders who actually understand what is going on are able to run rings around them. But nobody seems to want to discuss the issue. Instead they retreat to their religious texts and hide behind aggregations and assumptions. The economists fail to see the difference between ‘conversion’ and exchange. In conversion the supply of the liability shrinks. So the Bristol pound is deleted when the UK pound is issued. The UK pound is deleted when the pound of sterling silver is issued in a metallic system. The Barclays bank deposit is deleted when the £20 note is drawn from the ATM. That is what conversion is. Exchange is different. There is no deletion. When you exchange USD for GBP at the desk, the USD stays in circulation. It becomes the assets of the desk. That’s why the price floats, because the quantity is fixed. If the price stays the same the quantity has to adjust. The problem is *always* foreign central banks trying to make domestic entities whole in foreign currencies. Don’t do that. Make it very clear if you take a foreign currency loan, the CB will let you fail. Current account balances and capital flight are really fixed exchange rate ideas. They have a different effect in a floating rate system and I’m not sure we’re really clear what that is. Currency markets are very simple. It’s raw supply and demand. There are no market makers and every open trade has to be settled with delivery of the currency at 10pm GMT every day. That means you have to get hold of the real thing and give it to somebody else or get out of the market. So the actual final liquidity in the market that allows things to move comes from people actually changing what they hold over a daily basis. Those playing Contracts for Differences and throwing ‘forward next’ are just greasing the daily wheels with liquidity. Overall net short positions from an aggregator still have to be delivered. Let’s take Russia’s ‘capital flight’ and see how we can improve the situation there using a correct (MMT) approach. You have to supply roubles and take US dollars. That means getting the roubles in the first place and is an obvious control point in the system. The insights from MMT show that exports are a real cost and imports are a real benefit. The sanctions in place are stopping imports coming into the country. So there is no need for the exports. Russia should just turn the taps off, which would bring Europe to its knees in a second. That they haven’t done that suggests that Russia has the same problem as Argentina – the country is actually run by an Oligarchy that prefers to operate their export industry mostly in a foreign currency. So actually you can discount the entire oil and gas industry as a different country almost – I call it Gasistan – operating largely outside the Russian currency area. If there is a shortage of food and basic items brought about by the sanctions should be solved using a simple wartime approach – rationing. If there isn’t enough buckwheat to go around, then you can’t use price to resolve the distributional struggle. You’ll end up with starvation and riots and stockpiling of food. So assuming you care, then you’d ration the real goods for which there is a shortage and work at relieving the supply shortage. Set a price limit and a quantity limit. Start issuing ration coupons. And ban imports of Leah Jets, etc. You don’t need luxury goods when the country hasn’t enough food. The correct approach of any nation is to offer exclusive contracts to those nations that will take the state currency. Which of course they can if they do the necessary liquidity operations. That ensures a demand for the rouble. You don’t use foreign currency to pay for things. The deal never happens *at all* unless the financing arm is in place so that the customer can use their currency and the supplier gets their currency. Rationing is also there to stop hoarding – which is happening in foodstuffs. Domestic production can be initiated by the state simply causing it to happen. In terms of financing the Russian Central bank has to narrow the scope of Russian banks. Any lending to settle currency transactions in roubles should be banned. The Central bank should bar itself from directly intervening in the currency markets. And it should not be doing swaps into USDs, but offering to settle foreign debts for needed commodities – like buckwheat. In addition it should be offering financing in roubles to pre-pack administration proposals for any important business crippled by foreign currency debt. That forces losses onto foreign creditors in foreign currencies – as well as Russian USD holders. If you get moaning from foreign creditors blame the currency war. Then perhaps they’ll put political pressure on their own central bank to act and stem the losses. Beyond that the fiscal authorities need to start taxing in Roubles more – preferably the oil and gas pipelines. And then turning them off if they don’t get paid. The power play in Russia determines whether that is viable. Beyond that taxing USD accounts held at Russian Banks in roubles would help eliminate balances in those accounts as would a financial transaction tax on roubles (offsetable against real activity). You need more taxes to widen the currency area. And then you need more spending to offset that any get to full employment. In other words the government has to get bigger and pump more oil around the engine so that it doesn’t seize up. Thanks Bob, an interesting post, but I think I am still a bit vague on the fundamentals. It would seem that the problem might not be the direct transfer of financial capital out “Russia”, but rather that austerity is destroying the “Russian” capital base and that deregulation is allowing the trading of “Russian” property and consumables in the USD currency domain? very interesting post Bob- a bit beyond me at the moment but worth working on. MMT requires the mind to form a ‘Gestalt’ or what Wittgenstein called a ‘Perspicuous Representation’ a bit like holding a complex circuit diagram in the mind. Sorry Jake, didn’t mean to sound ‘snobby’- Bernays and Lippman were early marketing men who used psychological ‘insights’ to manipulate peoples’ ideas of what they want and has been a tool of Capitalism ever since. Its easy to sound pontificatory when talking about mass behaviours but finding the balance between freedom/compulsion and contingency/necessity in our lives is really hard work -education rarely helps with this. Bob good post, but adding to that: Exchange is limited through limited liquidity. Regulatory requeriments can stop on it’s track any “flight” (selling the currency against other) if banks are stopped from providing liquidity. You’ll find that NK economists make two mistakes. They assume FX has infinite liquidity when it doesn’t (because there are no market makers in FX as such) and they assume Bonds have finite liquidity when they don’t (since the market makers have to offer a price and are inevitably backed by the state). Economics seems to be the art of getting it backwards. “The ticking time bomb” you mention, Bill is I expect the inevitable destruction of our whole civilization.[?] A phenomenon which is now ordained. There is no possible way out. However if we followed MMT we can make life better and soften, even extend the better life for a while. It’s worth trying. Jean Baudrillard said “Prophesying catastrophe is incredibly banal. I agree, and think your whole blog expresses the dysfunction in our lives exaggerated by Neo-Liberal capitalist agenda etc. IMO our decline got going by about 1971 right after the peak achievement, technologically, of putting a man on the moon. It was the crossover point at which our consumption exceeded the planetary resource base. Maybe not so coincidentally, Nixon took the dollar off the gold standard and into the fiat money era. Decline is gathering speed every day. So it’s hardly a time for schadenfreude but the neo liberal era is bound to fail. It is speeding up our rush to collapse. The end game for neoliberalism will be the destruction of the economy and our culture. I don’t think we can turn it around in time. We need at least a preliminary catastrophe to wake us out of our passive acceptance of this status quo. As a way forward, Steve Keen advocates a private debt Jubilee as does David Graeber. I think MMT supporters would think it useful as well. I see it as a way to cull private debts without destroying the banks. We simply eliminate all loans made by fiat – thin air, leaving depositors sums intact. I heard recently that – at least in Aus- banks have to observe Client Money Rules which should quarantine client deposits. Banks have no need for them in loan creation now. Fiat money is behind secondary banking so that could be wiped off as well. With this reset banking could be remade to follow rules like those you have proposed. Our inability to sustain the current form of mass consumption only obviates the need to shift the output of our labors to something that is sustainable. Neo liberalism and it’s partner market fundamentalism are accelerating us toward collapse of productive capitalism when there is more work than ever to be done. This is occurring because without instructive fiscal policy as a guide, free markets are completely rudderless. Governments need to exercise the powers bestowed upon them for the common good. They have a responsibility to ensure that collapse does not happen. The only way to prevent the collapse is for governments to stop behaving as though MMT were not the reality and start putting people to work on the project of redeveloping our way of life. Sorry if I go off topic a little here but I wondered what Bill would think of John McDonells piece in the Guardian today. It also would help me with a problem I have with trade deficits. John seems to be understanding Sectorial balances (I think) as he refers to hosudehold debt increasing during government cut backs. He takes very seriously the massive trade deficit of the UK. I have got the impression that not all countries can have surpluses, some have to have deficits if others are in surplus, as with Germany and the EU. But is it wise to have an enormous trade deficit, as John describes? Could this undermine domestic job creation and maybe the possibility that your trading partners lose interest in trading as they may not want your currency, bonds or what ever. Sorry if my understanding is not very good here, but I am interested in figuring this out. I would suggest to all above that understanding the Modern Monetary System (MMS) is a necessary but far from sufficient condition for understanding Political Economy. The MMS is a formal system. To put it simply, there are two kinds of systems in the world. These are Real Systems and Formal Systems. A Real System is any system which obeys the laws of physics in particular and the laws of the hard sciences in general. A Formal System is any well-defined system of abstract thought based on the models of language or mathematics. The biosphere is a real system. The real economy is a real system. The financial economy is a formal system. The MMS is a formal system just as a constitution and sets of human laws governing political and economic behaviours are formal systems. In economics, as in other human discipline, the success or failure of the formal system depends on its accuracy and fitness to reality (the real systems as defined above). To short-circuit a long philosophical discussion about epistemology, consider Piketty’s now famous equation r > g. Of course, this formulation is point-in-history dependent. In other eras of capitalism, it was possible for r = g or r g (return on capital greater than economic growth) has this peculiar quality of relating a formal system term to a real system term. From our examples above, it is clear that this subject is not physics. It is also clear that it is not pure mathematics. It is “capitalist economics” which might say something not exactly praise-worthy about capitalist economics. However, it is very useful for Piketty to develop this equation and to show us that in different historical eras r g. It prompts us to ask what is going on and essentially reveals finance capitalism as a shell game. The world of classical physics is still relevant here. Humans and their economy are comprised of macro objects. Classical laws hold to a high degree of accuracy. cognitive elements (concepts or symbols) that represent them as accurate as possible. That can be achieved by simple observation, where information about external phenomena is collected and registered, thus further completing the internal picture that is taking shape. In the limit, this should lead to a perfect, objective representation of the world outside us, which would allow us to accurately predict all phenomena.” – Complexity and Philosophy – Francis HEYLIGHEN, Paul CILLIERS, Carlos GERSHENSON. Of course, we don’t achieve that limit of perfect knowledge for at least three very good reasons. One is extensiveness. The entire dataset of the world is too enormous to compute even deterministically. Secondly, indeterminism and perhaps even free will exist (that is if free will is different from indeterminism). Thirdly, there is the issue of emergent and evolutionary phenomena in complex systems. Accepting the above limitations or caveats (otherwise we would be lead into many more complexities beyond this post), the issue in our macro economic world is to first make “the mapping or correspondence between the external, material objects and the internal, cognitive elements (concepts or symbols) that represent them as accurate as possible”. It is clear that our finance system poorly represents reality in the translation of the real to the formal or notional. That r can ever be > g is diagnostic of this problem. One must deduce that r ought always be equal to g as follows: g (growth) = production – consumption. Economic growth must equal real net asset capital accumulation (growth in material wealth). This would be true if return on capital reflected genuine real asset accumulation. Clearly, Capitalism is a formal system at variance with the real world. The “call” of certain actors on real assets does not obey physical laws. Rather it obeys other laws which the finance system does not explicitly recognise and impute like legal and military violence as physical force. The capitalist finance and ownership system poorly represents reality. MMT can treat some symptoms of the current system. To remove the systemic problems the system itself must be changed. I am sorry, slightly more than a whole paragraph was somehow lost from my above post. This has considerably weakened my argument. The problem seems to be that some mathematical symbol I used (the less than symbol probably) caused an elision of a block of text. If I attempt to correct this I will double-post or cause some other problem. This is just another example of why blogging is such a limited tool. Sigh, sorry again. power of the government to tax and spend. more generally and is a part of a self serving political economical neo liberal strategy. to have all they want . I do not mean this as a conspiracy .Although I do not know what the elite may collude on . and wealth is absolutely central to the self serving neo liberal ideology. MMT sees Debt Creation (Govt Bonds) as an interest rate mechanism which is a description of a real system using a different GESTALT. Also, as economics is always an ‘ex post’ model based un unquestioned assumptions about human behaviour there is a tendency to put the cart before the horse-MMT seems to get the cart in the ‘right’ place, or try to. In the case of a weather system, it can be much more easily modelled, or more effectively, than economics because of the separation of the observer from the observed (although this breaks down after a certain point) with economics we have something (cultural forces) that is created by our own consciousness being analysed by it. I agree with your definitions of formal and real systems, but I would add to that complete/completed systems. Three distinctions is always the best way to look at and discern matters because it assumes an integration of opposites which results in a more unified, complete…and third and distinct reality. It’s more dynamic and open ended/open minded. You could call formal systems pragmatic systems, real systems scientific systems and complete/completed systems wise systems. Pragmatic systems like we have today in economics are problematic given the fact that man is basically good but flawed and without continual vigilance against such flaws its devolution grinds to an unhappy result. The pragmatic DSGE/neo-liberal system would claim to be both a scientific and complete system, but that emperor of course has no clothes on. Scientific systems are definitely a step up in that there is more data and mental rigor involved and so another level of completeness. But science, unless it is very good as in open minded science (and the signature of scientific breakthrough is always a higher and more complete integration and unification) is not sufficient in and of itself….because it is not a completed method or ethic. And that is why wise systems are necessary if we want actual and complete answers because Wisdom is the integrative process itself and an ethic of continual and complete integration is what is required. Then if we ask what are the aspects of Grace/graciousness we see that among its many aspects are sovereign, abundant and additional self control/creation of money (MMT), continual temporal/structural and systemic financial presence as a bulwark against dominance and the inevitable change that occurs in the temporal universe (Public Banking) and Gifting directly to the individual and within the system in order to have complete policy follow through and empowerment of individual freedom and systemic free flowingness (Social Credit). Even disequilibrium theory begs the question: How is equilibrium created? which would be integrating the reality of disequilibrium/continual flux with policies that effected balance, equilibrium and flow which not coincidentally are the major aspects of both Grace and the classical and correct goals of economics. So for the sake of all of us in a troubled world where modern and utterly destructive weaponry is also a reality we would be wise to integrate all of these leading edge theories into a movement that could herd the entirety of the political apparatus toward such workable, scientific and completed policies. As Warren Mosler says it’s only a deficit in money. It is a surplus in real things. So the standard MMT view would be that a so-called trade deficit is a net benefit to society because of that surplus in real things. We just let the currency float and everything takes care of itself. The Govt deficit spends as necessary to maintain full employment and steer a sensible path between the dangers of high inflation on the one hand and having too much unemployment on the other. This would be the text-book MMT position. My only problem with this is that if the currency moves too quickly we have a situation where steel works, food canneries, car factories, etc etc are at one time being mothballed, or even worse closed down, because they aren’t economic and at another time hastily being re-opened because they are needed and are once again economic. That’s not a good way to run any successful industry, many of which are needed for strategic purposes. Warren Mosler does allow the ‘strategic purposes’ argument in his excellent book “The seven deadly innocent frauds” which is free on-line. I’d suggest you take a look at that. I’d probably go a little further than Warren and do whatever in took to maintain continuity of employment and production in strategic industries, but there are some MMT purists who I know will disagree. PS I’m slipping back into my old Keynesian ways! I should have said “too many people on the JG” rather than “too much unemployment”. But an argument on the JG is for another day! I will re-post my lost paragraph here. Then in a further post soon I will address some comments on my previous post. This all relates to my post above about systems (real and formal). I will re-post with the proceeding and succeeding paragraphs to give context. I will also state up front that I am trying to develop, really for my own interest, a new way of looking at economics: though attempts to look at economics via complex system theory are not new of course. Finally, I should say I think modern economics, including MMT I believe, has serious foundational problems at both the philosophical and empirical levels. This is precisely because economics has not yet grasped the full importance of complex systems, emergence, evolution (biological, technological and noological (relating to the mind, individual and collective and ideas)). At the same time, I am a lay philosopher not a professionally trained or practicing philosopher. Quite frankly, I might just be an amateur crank stumbling around. I recognise that and willingly take the risk of making a complete fool of myself. Note: symbols for less than, equal and greater than have been changed to LT, E and GT. This is to prevent an editing bug (or feature) deleting some of my text. “In economics, as in other human disciplines, the success or failure of a formal system which intends to interact with real systems depends on its accuracy and fitness to reality (meaning the real systems as defined above). To short-circuit a long philosophical discussion about epistemology, let us consider Piketty’s now famous equation r GT g. Of course, this formulation is point-in-history dependent. In other eras of capitalism, it was possible for r E g or r LT g to occur and these eras did happen according to Piketty’s data and interpretations. The most salient feature of this equation is that it implicitly relates a formal system value to a real system value. Return on capital (r) is a formal system value of the formal financial system. Real economy growth (g) is a real system value albeit formalised by subsequent measurement methods. To generate a physics equation we must relate a real system value to other real system values. For example, F = ma, (Force = mass x acceleration). To generate a true formal system equation, all terms must be formal or notional. For example, the equation x squared = -1. I have chosen this equation as its solution requires an imaginary number i as in x = i where i is the square root of -1. This helps make the point that the equation is formal and thus unreal in the primary ontological sense. “Accepting the above limitations or caveats (otherwise this would be led into many more complexities beyond this limited post), the issue in our (macro-sized) economic world is to first make “the mapping or correspondence between the external, material objects and the internal, cognitive elements (concepts or symbols) that represent them as accurate as possible”. It is clear that our current finance system, ownership laws and reward allocation systems poorly represents reality in the translation of the real to the formal or notional. That r can ever be GT g is absolutely diagnostic of this problem. One can deduce that r ought always be LT g if the formal system accurately represented the real system. Consider, g (growth) = production – consumption. Economic growth equals real net asset capital accumulation (growth in material wealth and imputed wealth like intellectual property and good-will which still are ultimately founded on real, material system complexity). If r is set above g by the formal economic system, this proves the system does not match the real system. Thus the error is not just an ethical values error (though it is that too) it is actually an empirically detectable error of a mistake in reflection-correspondence at the classical (Newtonian) epistemological level. Clearly, Capitalism is a formal system at variance with the real physical world. This was observed when M. Hubbert King pointed out that the finance system depended on endless, exponential growth in a finite system (the biosphere). In fact, it was pointed out much earlier when Marx used the terminology “metabolic rift” for the rift between industrialism and nature. In modern Marxian thinking this has been retermed the “ecological rift” and refers to the ecological sustainability of certain industrial system processes like further CO2 emissions. The essential political economy problem at this level is that the “call” of certain actors on real assets does not obey real physical laws. (Rather this “call” turns out to obey other real biophysical laws which the finance system does not explicitly recognise and impute; like legal and military violence as physical force). The capitalist finance and ownership system incorrectly represents physical, ecological and even social reality. To remove these systemic problems, the system itself must be changed entirely or complex civilization will not survive. Some of the problems can be solved by building up *real* buffers. Output can go to the buffers. That also helps dampen the swings. The US has a buffer of oil, and China has all sorts of buffers. You can have a buffer of wool stocks , which is an example Bill himself uses in support of the JG. But you can’t so easily have a buffer of human skills. So while I do understand the text book MMT theory that net imports are a net benefit, we do have to bear in mind that they are only a net benefit when the economic conditions are such that we enjoy those net benefits. If conditions change and we suddenly find we need to make computers, for example, but we no longer the skills available in the economy to do that then we’d be in big trouble. So, I’m always suspicious of ‘text-book’ theories. Even MMT text-book theories! :-) Which I would accept are generally correct as far as they go. But, we always need to be aware of that and ask ourselves the question of ‘what can possibly go wrong?’ and plan accordingly. No one points out that banks as intermediaries is the fix for mass-consumption fueled by consumer loans packaged into ABS bought by Hedge Funds and served to the Pension Funds of the upper-middle class? While at the same time government procurement/taxation makes sure that ‘capitalists’ get to decide how much to share with the lower classes.